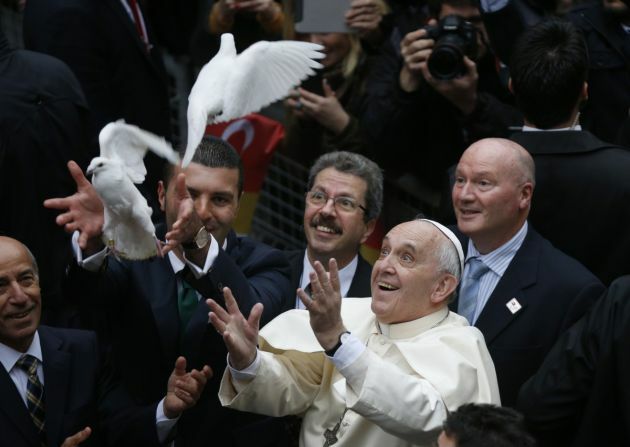 (Photo: REUTERS / Stoyan Nenov)Pope Francis releases a white dove prior to delivering a Holy Mass at the Catholic Cathedral of the Holy Spirit in Istanbul November 29, 2014. Pope Francis began a visit to Turkey on Friday with the delicate mission of strengthening ties with Muslim leaders while condemning violence against Christians and other minorities in the Middle East. 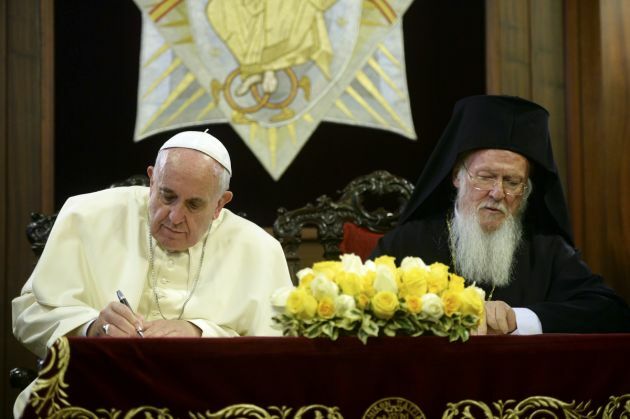 Pope Francis and the Ecumenical Patriarch Bartholomew I, spiritual leader of the Orthodox world, have signed a Joint Declaration reaffirming their desire to overcome the obstacles dividing their two churches. The Catholic and Orthodox church leaders also deplored the dire situation facing Christians and all those suffering in the Middle East. They called for an appropriate international community response, the Vatican news service said on November 30 on the third day of Pope Francis's visit to Turkey, where around 98 percent of the people are Muslims. "We express our sincere and firm resolution, in obedience to the will of our Lord Jesus Christ, to intensify our efforts to promote the full unity of all Christians, and above all between Catholics and Orthodox," the declaration said. Leaders of the Armenian and Assyrian Orthodox Churches of Turkey were also present at the joint Sunday Mass conducted by Ecumenical Patriarch Bartholomew and Pope Francis. The Ecumenical Patriarch is often seen as a key leader and a first among equals among Orthdox patriarchs, but the Russian Patriarchate is the most numerial Orthodox church. The Roman Catholic schism with Eastern Orthodox Churches occured in 1054. The churches split over differences on the primacy of the papacy, but in recent years the churches have grown closer together. The Greek Orthodox church under the Ecumenical Patriarch of Constantinople is a member of the World Council of Churches that groups more than 550 global Christians from mainly Anglican, Protestant and Orthodox traditions. The Roman Catholic Church is not a member of the WCC, but the two cooperate on many programs and projects and the Holy See belongs to the WCC's Faith and Order Commission. "We intend to support the theological dialogue promoted by the Joint International Commission, instituted exactly 35 years ago by the Ecumenical Patriarch Dimitrios and Pope John Paul II here at the Phanar," the joint declaration said. On the second day of his visit Francis visited the Sultan Ahmet mosque, also commonly referred to as the Blue Mosque known as one the masterpieces of Ottoman architecture. There the leader of the world's 1.3 million Roman Catholics stopped for two minutes and clasped his hands in reflection. with his head bowed. Facing Mecca, the Pope stood next to Istanbul's Grand Mufti Rahmi Yaran in a gesture the Vatican described the gesture as a "moment of silent adoration" of God. Later Francis paid a visit to the Hagia Sophia, the most important cathedral of Orthodoxy for almost 1,000 years. In 1453, the Ottoman Turks under Sultan Mehmed II conquered Constantinople. Mehmed then ordered this main church of the Orthodox Christianity converted into a mosque. The basilica became an imperial mosque under the Ottomans when they conquered the city in 1453, and was turned into a museum in 1935 after the foundation of the Turkish republic in 1923.